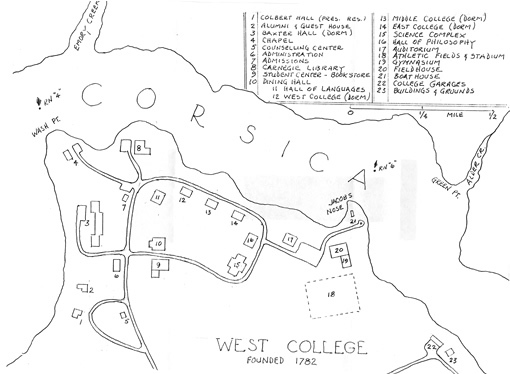 West College had its origin as a seminary to train young men for the ministry. Oueen Anne’s County witnessed a strong influence from the developing Methodist Church, an influence that spread all along the Eastern Shore of Maryland. The initial plan was to locate the seminary in Queenstown on the Chester River, but John Hall, a member of the County Assembly and an overseer of the Methodist movement, argued successfully for a location along the Corsica River after the Assembly voted to move the county seat from Oueenstown to Centre Ville which, at the time, was little more than a crossroad of the main road from Chester Mill to Church Hill and the lane to the Corsica Warehouse, a tobacco customs house at the headwaters of the Corsica River. The year was 1782 when the Assembly authorized the construction of a county courthouse on four acres of land adjacent to the crossroad. The town-to-be was close to the center of the county, hence its name; and the spelling reflected the post-Revolutionary War admiration for the French. The seminary was founded two years later, in 1784, ten years before the courthouse was finished and the first case was heard. President Fancher remains part of the lore of West College for he admitted as a matriculant a talented Indian youth named Sansom who turned out to be a real spellbinder of a preacher who also helped raise money for the seminary. All the early presidents were ministers, but when the Maryland legislators voted to grant a charter to the institution, its formal relationship with the Methodist Church terminated and the stipulation that the president be a Methodist minister no longer applied. The year was 1846 and what had been known simply as The Seminary became West College, an independent liberal arts institution, named to honor Thomas West, an important person in the development of the colonies. Also known as Lord Delaware, Thomas West arrived in Jamestown, Virginia in 1610 where he served as a member of the Privy Council of Queen Elizabeth, I. As the Seminary and West College grew over the years, so too did Centreville. The town now occupies a tract of land earlier known as “Chesterfield”, The original commissioners of Centreville, who were appointed by the legislature in 1794, laid out the town in 37 lots along two north-south streets, Liberty Street and Commerce Street. The courthouse stood between them. Later an east-west road was added, Water Street. By act of the Assembly in 1796 provision was made for the erection of a Market House behind the courthouse, with Wednesdays and Saturdays set aside as market days. In 1804 the first school opened, but the primary school system was not established until 1826. By the mid 1800’s Centreville had become a center of commerce for the area. To places of business were added several churchs, two taverns, a hotel, and a volunteer fire company. When the College received its charter in 1846, the Catalogue of the Corporation listed a seven member board of trustees: Josiah Bacon, Joshua Spencer, S. Newton Dexter, James R. Lawrence, Samuel B. Woolworth, Edmund E. Wetmore, and Othniel Williams who also served as secretary and treasurer of the board. The faculty consisted of Charles Avery, LL.D, Professor of Natural Philosophy, Chemistry, and Civil Engineering; Johannes Root, Professor of Mathematics, Astronomy, Mineralogy, and Geology; Theodore William Dwight, A.M., Professor of Law, History, Civil Polity, and Political Economy; and Anson Judd Upson, A.M., Professor of Rhetoric and Elocution. There were no electives. The Freshman Class studied Livy’s History, Algebra, Rhetoric, Heroditus’ History, Geometry, and Horace. As Sophomores they studied Homer’s Odyssey, Plane Trigonometry, Demosthenes, Mathematics of Navigation and Surveying, Select Greek Tragedies, and Spherical Trigonometry. As Juniors, Differential and Integral Calculus, Natural Philosophy, including Mechanics, Tacitus’ History, Logic, and Rhetoric. As Seniors, Constitutional Law, Intellectual Philosophy, Chemistry, Natural Theology, Municipal Law, and Civil Engineering. The curriculum has changed over the years and is much less heavily weighted toward the classics. In form it matches that of other contemporary liberal srts colleges except for the recent addition of nursing and hotel management, two programs added in an effort to increase enrollment.